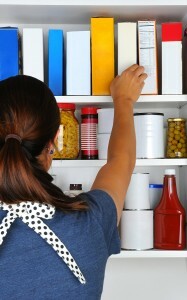 Homeowners in Garner, NC, know that closet organizers can bring order to even the messiest closets. Whether that closet is in the kitchen, a child’s room, or the master bedroom, smart homeowners choose 31-W Insulation to solve their storage dilemmas. When designed properly, your closet organizers can actually help make everyday tasks more efficient. You’ll discover that getting dressed in the morning is easier when you can find your items quickly. You’ll be pleased when dinner preparation, whether gourmet or on-the-go, is easier because your pantry is organized and the items are easily accessible. And you may even find that your children will have an easier time keeping their rooms tidy if they know that there is a place for everything in their newly organized closet. Laminate/wood – You can choose from gorgeous wood or laminate finishes such as cherry, warm cognac, white, antique white, and more. Wire – Choose from wire finishes in nickel, silver, satin chrome, or white. To learn more about how closet organizers can solve your storage dilemmas and help bring a little order to your home, contact 31-W Insulation today. We will happily provide you with a complimentary consultation so you can start designing your efficient, new closets for your Garner, North Carolina, home.